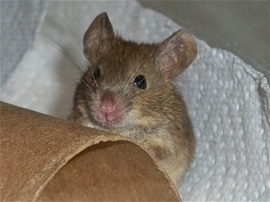 On Jan. 5, 2013, we found a poor, tiny, loudly crying house mouse (approx. 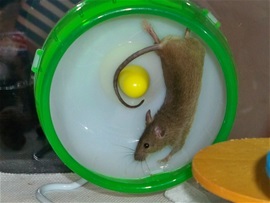 3 weeks old) stuck on an evil, hideous, inhumane gluetrap at a local heartless retailer. We took him home, freed him from the trap (using peanut butter and vegetable oil) and let him recover. He rested for over 24 hours. He was missing fur on his right side, had a bloody nose region, and walked without putting weight on his right arm for over 3 weeks. 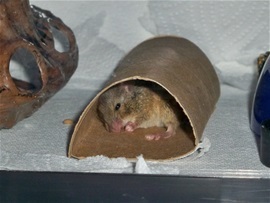 Recuperating from his horrible ordeal, curled up and sleeping in a toilet paper roll. 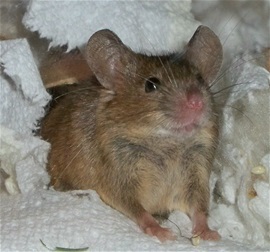 We were going to release this little cutie back into the wild but he never "acted wild" or unhappy in his surroundings. In fact, he seemed at home with us immediately. 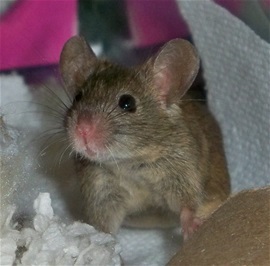 So, we named this little miracle mouse MARTY ! After about 36 hours, we put Marty in a 10-gallon hamster cage, loaded with toys and food. He came to life, playing and exploring and eating! 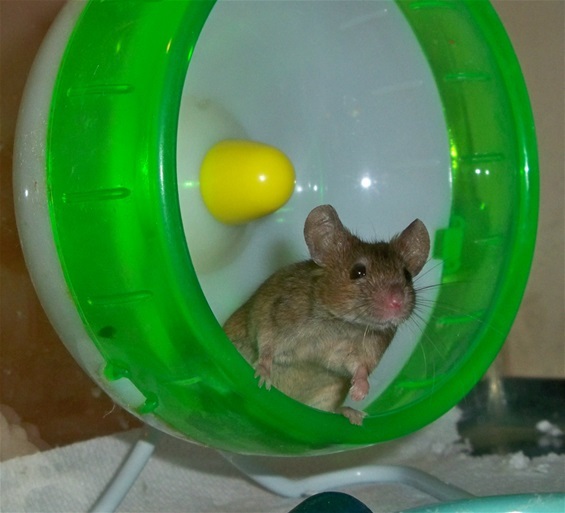 Marty's Fave Toy: His exercise wheel! He "spins" for hours! He even sleeps in the wheel at times. Precious Marty is very photogenic! 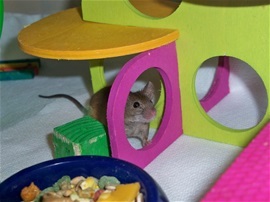 Marty builds quite elaborate "nests" for sleeping, hiding, relaxing! Love that smile! 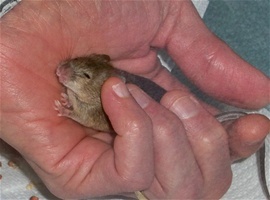 Even a creature as small as a mouse appreciates a good back rub! Whoops! Sometimes Marty gets over zealous while spinning! Even when Marty is busy playing, calling him by name will get his undivided attention! He was "Pet of the Day" on Oct. 16, 2013! 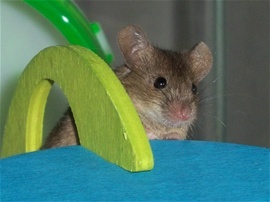 Multi-millionaire publisher, William Randolph Hearst, refused to harm mice that found their way into Hearst's 165-room Castle in San Simeon, CA. 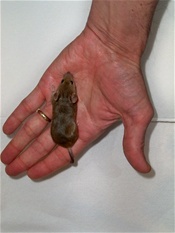 He insisted that mice be caught humanely and released on the Castle grounds! All animals (pets, wildlife & even birds) have been sad victims to these cruel, slow-death traps! 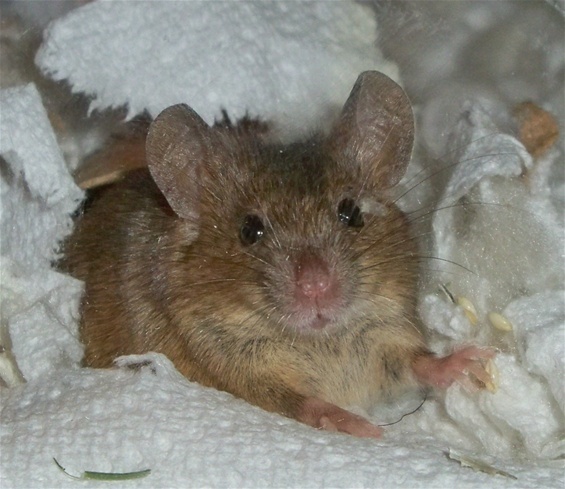 Mice HATE the smell of peppermint. Using peppermint oil (available at Amazon, eBay, Walgreens, etc.) 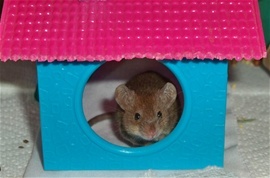 will rid your home of mice humanely! We are not encouraging/recommending adoption of wildlife. 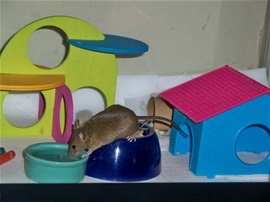 NEXT PAGE: MORE Marty Mouse Photos! 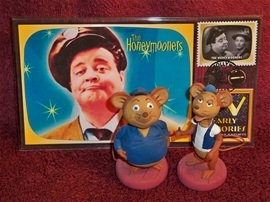 FAQ: Where did MARTY MOUSE get his name? A comic genius (only when he is NOT political or anti-American)! Man of 1,000 Hilarious Characters! 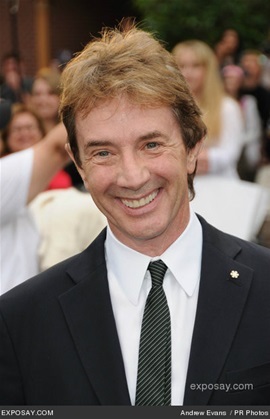 Star of 2 of the funniest modern films of all time: "Clifford" & "Three Amigos"! Star of stage, screen & TV!